Recent release “Laying the Foundation for Nigeria's Democracy” from Page Publishing author Professor Humphrey N. Nwosu is the most authentic analysis and explanation of Nigeria’s political environment under which the June 12th election was held and how the result was tragically annulled, even as it was accurately adjudged as the freest and fairest in the history of the country. Professor Humphrey N. Nwosu, who has an extensive teaching, research, and public service career, has completed his new book “Laying the Foundation for Nigeria's Democracy”: the theoretical thrust deals with the crux of the problems that face the task of nation-building in Nigeria which is legitimacy. Published by New York City-based Page Publishing, Professor Humphrey N. Nwosu’s theoretical work deals with the crux of the problems that face the task of nation-building in Nigeria, which is legitimacy. Prudently, the author examines how the Nigerian leadership tends to attract legitimacy and its acceptance from the generality of Nigerians. He documents the centrifugal and centripetal forces that combined in various ways to shape as well as influence President Babangida’s transition program. The program is analyzed and compared with the previous transition program, and the process, its special features like its phased nature and its inbuilt learning process are identified. 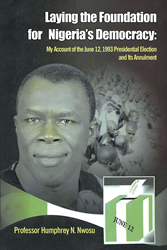 Nwosu concludes the book by stating unequivocally that Nigerians found a great deal of opportunity for real and genuine democracy during the June 12th presidential election and they grabbed it. The outcome of the election and its annulment had whetted the appetite of both the majority and the minority ethnic groups of Nigeria. There is therefore a burning desire for equality, fairness and freedom for all Nigerians. Suggesting how Nigerians can solve their present political problems, he reiterates that the June 12th presidential election lays a strong foundation for democracy in Nigeria, and also maintains that June 12, 1993 election was indeed the Real Democracy Day in Nigeria while May 29, 1999 was its offshoot. Readers who wish to experience this inspirational work can purchase “Laying the Foundation for Nigeria's Democracy” at bookstores everywhere, or online at the Apple iTunes store, Amazon, Kobo, Google Play or Barnes and Noble.